Teach For All supports and connects a global network of national organizations to advance educational opportunity in their countries. Each organization in the network, launched by a local entrepreneur, enlists its nation’s most promising leaders to teach in high-need areas for two years and, in the long term, drive changes in the education sector. Their partner organizations, Teach For America and Teach First, have over the past combined 32 years demonstrated an ability to increase student achievement. 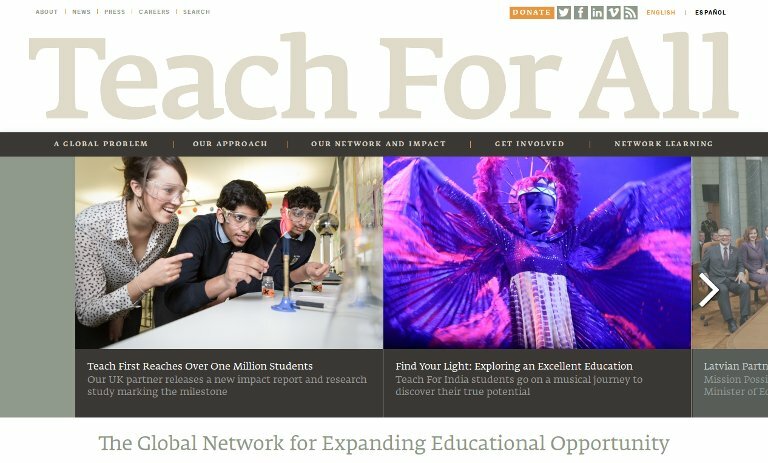 Teach For All was launched in response to demand from entrepreneurs around the world seeking to start Teach For America and Teach First-like enterprises in their own countries. These enterprises provide highly competent teachers who lead students to significant academic achievement, despite poverty and the limited capacity of their country’ schools. Teach For All helps these organizations learn from each other by sharing resources and experience, enabling them to have a greater impact sooner. Since 2007, 21 countries have launched new programs supported by Teach For All, while entrepreneurs from other countries explore the model. The organization exists to address global educational needs and enable students to realize their potential. A child’s background often determines their educational and life prospects. Poverty, discrimination, social mobility and political structures create challenges for students, and in certain cases, entire societies. Many school systems lack the capacity to help students attain a quality education, and prevailing beliefs have not led to the necessary policy investments to address these issues. In 2012 alone, the Teach For All network will collectively field more than 14.000 teachers who will impact the lives of nearly one million students. Meanwhile, a force of roughly 26.000 alumni are now serving as advocates for educational equity, working from across professional sectors to ensure all children have the educational opportunities they deserve.